Beech Blight Aphid (Grylloprociphilus imbricator). Also called Beech Wooly Aphid, this wooly aphid species congregates in dense colonies on small branches and the undersides of leaves of the American Beech (Fagus grandifolia). Often, sooty mold is found in association with this aphid, as the fungus feeds on the aphids' honeydew-like excrement. 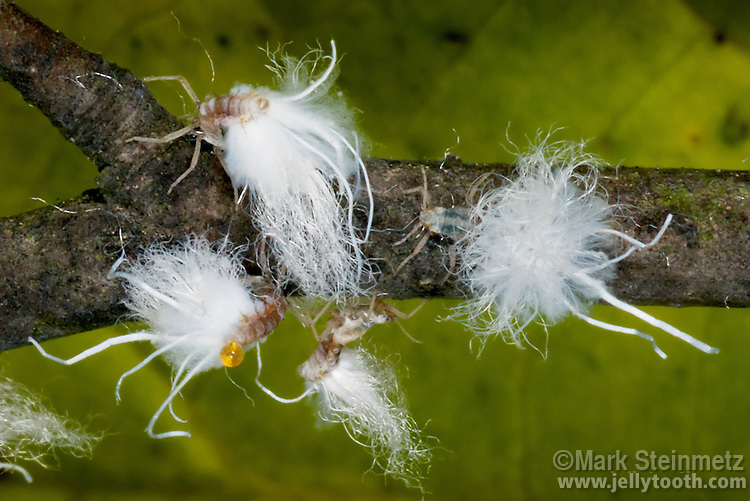 The cottony appearance of the aphid is due to waxy filaments growing from its body. A drop of honeydew can be seen on the aphid lower left. Mohican State Forest, Ohio, USA.